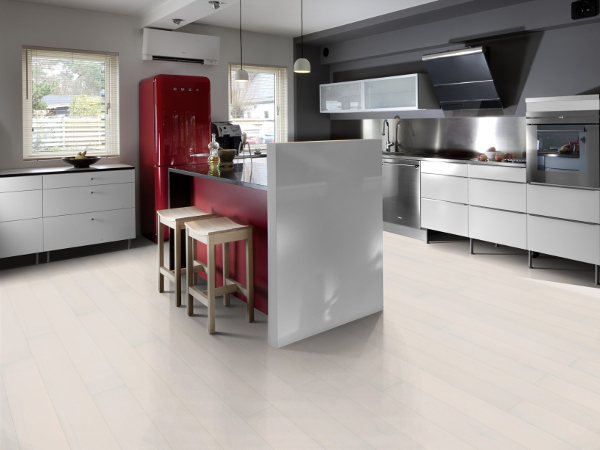 From white wood flooring through to white tile flooring, in this Home Flooring Pros guide we show you your white flooring options, the pros and cons of light colored floors, where to buy and plenty of ideas to share and inspire. With all the hustle and bustle of everyday life, many of us are looking to create homes that are an oasis of calm and peace, where clutter and chaos are minimal, and rest and harmony are key. 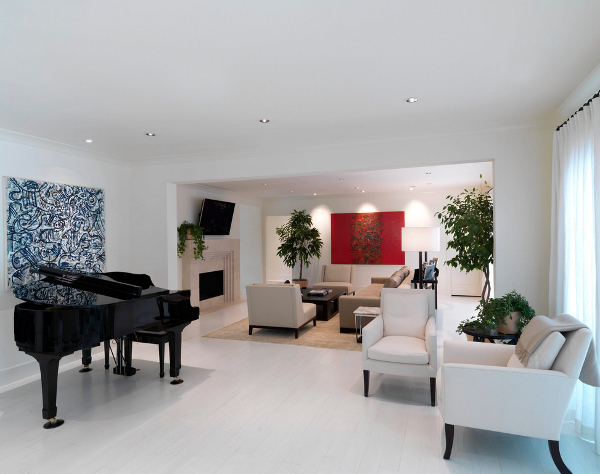 This is in great part the promise of white flooring paired with a predominantly white space. Check out inspirational articles about homes with white wood floors and you’ll see image after image of wonderfully light and airy rooms, immaculately styled to offer just the right balance of comfort and style. But for those who haven’t yet made the leap to white or light floors, there’s a little niggling question: what is the actual reality of living with light wood flooring? Aren’t they a tremendous hassle to keep clean? And what is the best way to achieve the look to ensure it continues to look pristine over the years? So let’s discuss your different options for achieving this look, the pros and cons of white flooring, and important things to consider before opting for this potentially life-changing choice! 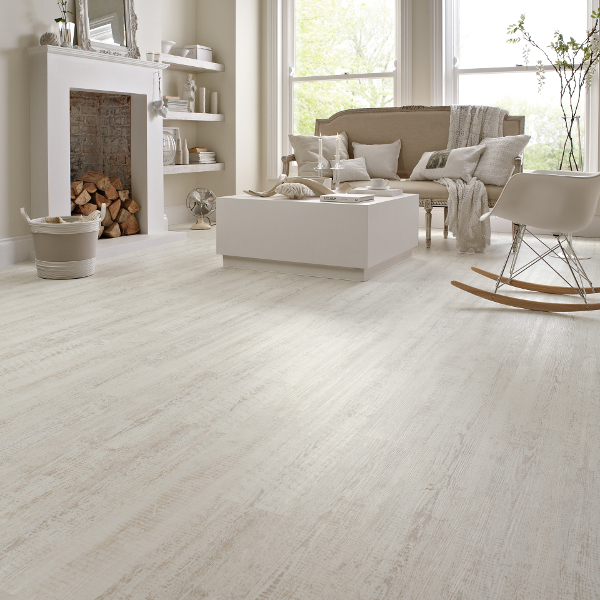 White wood flooring is one of the most popular options for creating a light/white flooring look. It’s a fairly simple option if your house already has hardwood floors, as you need only to sand the floorboards back and then paint over them with good quality white floor paints and sealants. Another option with light toned solid hardwood flooring – like white oak or ash – is to bleach the bare boards and then add a whitewash stain. To avoid all that sanding and painting, white wood flooring can also be achieved by installing brand new engineered hardwood floors that have been pre-finished with white stain or paint. Alternatively, if you like the look of wood but don’t have the budget there are a number of white-toned luxury vinyl tiles or wood-look porcelain tiles that will achieve the same look. Painted, pre-finished or faux-wood options can also offer a variety of styles: you can opt for white wood floors that are completely even toned with glossy surfaces, choose a more distressed, slightly worn finish, or have a wash or stain finish that allows the natural grain to be more visible. But wood flooring is not the only option for getting the white floor look. White floor paint or glossy epoxy screed can be applied to concrete; near white concrete can be mixed using white sand and Portland cement; and of course there are also natural stones such as white marble or limestone slabs, or a compound terrazzo paver with white marble and quartz chips. 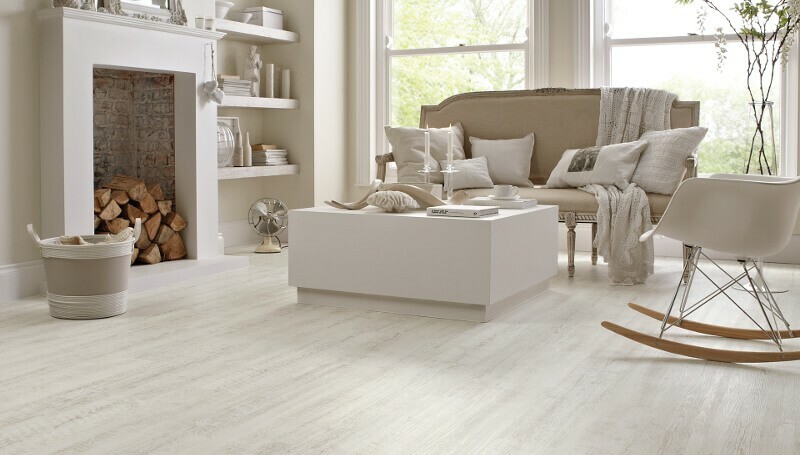 Further alternative options for white flooring include white porcelain tiles – often chosen for bathroom applications; white sheet vinyl or rubber flooring is another option; and finally, of course, there are some gorgeous white carpets available on the market. So, in short, just about any kind of flooring material has a white version available! Scroll down to see our examples of all these different white flooring options, but remember not all options are going to be right for your home. So if you like a particular look, then you should investigate each material option further to see if it really will suit your project. 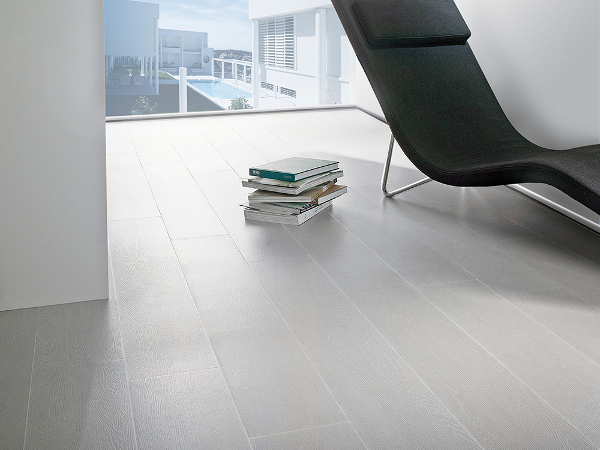 For the ultimate pristine white wood look, the Tavola White porcelain tile from Porcelanosa is hard to beat – lots of detailed, grainy texture with zero possibility of the color ever wearing away. So you’ve chosen the type of white flooring you love and it’s going to work for your project; but is it right for you and your lifestyle? 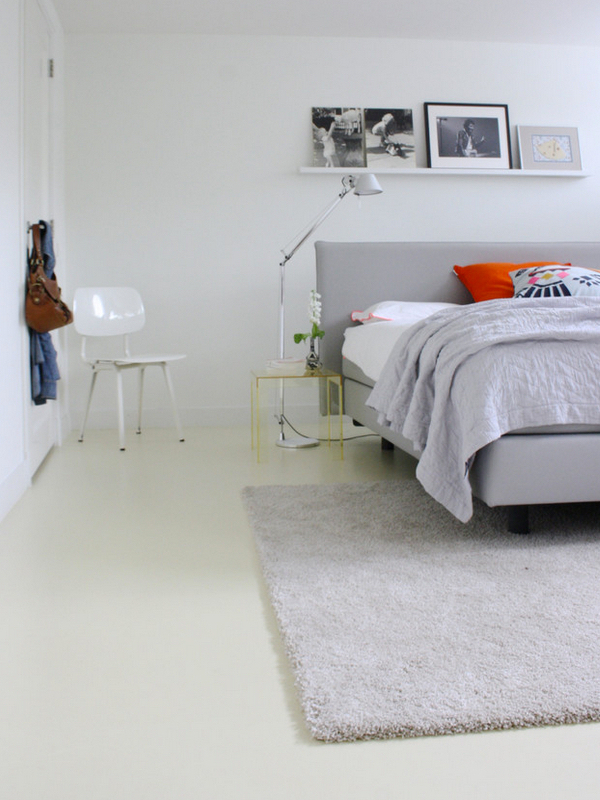 Let’s look at the pros and cons of white flooring. For a start, whilst you might imagine that white flooring goes best with a super minimalist aesthetic, in fact – depending to a certain extent on the material you choose – it actually goes with all décor styles. If you like the shabby-chic, farmhouse or warm industrial vibe then a painted white wood or concrete flooring is a great compliment; whilst an ultimate glam interior design is exactly the place for a super luxurious, velvety soft, white carpet. White flooring also has the advantage of truly showcasing your furniture, soft furnishings or art – this is especially true if the rest of the space is also mainly white; though it must be said that white floors are also a great counterbalance for walls that are painted in dark colors or that have with bold treatments, like a magnificently overblown wallpaper. So the main worry with light wood floors is this: no matter what kind of material you use, it is going to present challenges to keep pristine! Don’t be fooled by anyone on a forum who says that a particular white floor is easy to clean – that technically may be so, but you must also be prepared to sweep or vacuum and mop very frequently – perhaps even daily depending on how active your household is or how low your tolerance of daily mess is. My personal experience a few years ago was of renting a home with white ceramic tile. It was really lovely to look at, but at the time my two kids were both under 4 and we had a cat who specialized in creating massive fur-balls…so I had to either considerably increase my tolerance for slightly dirty floors; or go crazy sweeping and mopping every day. On the other hand, it was nice to know that the floors were definitely clean! You can, of course, mitigate for lots of dirt tracking through your home by placing strategic area rugs and doormats, and also by installing a “no shoes indoors” policy in your home. Opting for white flooring that has texture, a hint of pattern, flecks of other colors, or the distressed painted look will also make spills and everyday dirt less obvious. Ultimately, whether or not you can live with a white floor when you have kids and/ or pets is something only you can decide: if cleaning floors every day goes beyond what you would consider necessary for general floor maintenance then white flooring is not for you! By the way, it’s worth mentioning that you will face this exact same problem with very dark hardwood floors as well! Another potential concern if you’re opting for white flooring is that you should be sure to check the white tone you are using; because, as this recent article about white paint from Elle Décor demonstrates, not all white tones are the same. Some extra bright white tones may cause extreme glare and tire your eyes – particularly if your space gets tons of direct sunlight! Also, if you’re planning white walls and trims, then you may want to make sure the whites match or compliment each other. Finally, that clean, uncluttered, airy look you love might actually seem clinical and cold to others; white flooring is a very personal style choice and possibly a risky one to use throughout your home if you think you’ll sell your home one day. Certainly I would not recommended white flooring if you are flipping homes. 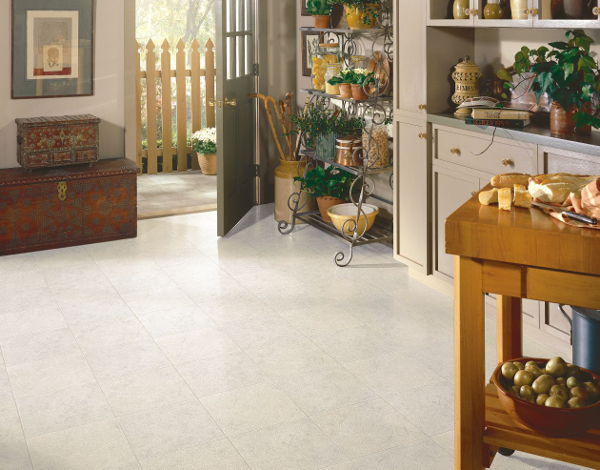 The off-white mottled pattern on this vinyl flooring from Armstrong is a good choice for a kitchen or mudroom, as it will look cleaner for longer! To really get this look right, you need to ensure a good finish and that means making sure you are either a very confident and skilled DIY’er or hiring a professional. For example bleaching certain hardwoods will open the pores and weaken the wood fibers, making them more susceptible to wear and damage; ensuring a correct application of a water based polyurethane sealant will counter this. Similarly applying epoxy screed onto concrete is relatively straightforward, but the results very much depend on careful preparation of the concrete subfloor to ensure that it is level, clean and correctly primed. Even the best painted wood or concrete floor will get worn out – this is great if you like the distressed, shabby chic look, but if not then be prepared to repaint every couple of years. Also you should be careful to choose paints and sealants that won’t yellow over time – always opt for water based paints and sealants, not oil-based ones; exterior or marine deck paint is a viable option. If you’re planning on white carpets or area rugs, be sure to choose brands that have built-in stain protector; and have a carpet cleaning kit readily available for those accidental spills that may occur! 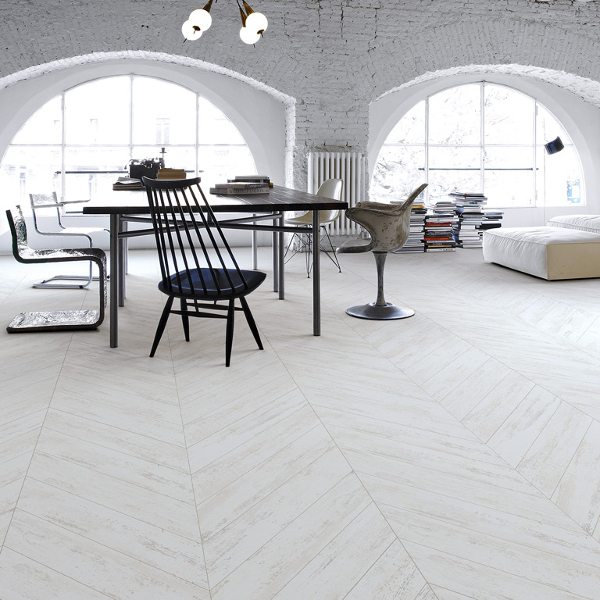 There are many flooring retailers now selling white flooring in all types of different materials: here’s a selection of some of the best. If you like white flooring, but aren’t quite ready to commit to changing up all of your floor then a white area rug is a good option, and at Wayfair you have a ton of choice! In fact over 2000 rugs come up when you search for “white area rugs” on their site, though many of these are actually patterned rugs with white accents rather than completely white. Nevertheless, there is a large selection of pure white rugs including shag and faux fur rugs from manufacturers such as nuLOOM and Safavieh; the rather lovely Zayan Meika ivory rug from Bungalow Rose which features a knitted wool cable pattern; and the superb Asia White rug from Nanimarquina which features an abstract floral pattern woven in relief into the tuft. Wayfair also have an extensive selection of white porcelain, ceramic and natural stone floor tiles, including the gorgeous Natural Stone Sticks mosaic in white from Pebble Tile; and a smaller selection of white wood, laminate or wood alternative flooring, such as the Glacier White engineered cork flooring from Albero Valley which has a beautiful whitewashed look with defined grain detail. Online DIY retailer BuildDirect have an extensive selection of flooring products including 105 white or near-white hardwood flooring and wood alternatives such as bamboo and cork, and as well as their own home brands they also stock big brands such as Kährs, Mohawk, Shaw and Armstrong. BuildDirect also have an excellent range of white porcelain tiles – currently over 250 different white tiles listed on the site including wood look and stone look tiles – I particularly like the Takla Statuario Polished Marble porcelain tile which has a very authentic veining and the Salerno Modern Wood tile in white which has a gently distressed look with gray undertones. There is somewhat less choice in the BuildDirect LVT collections, but you’re sure to get a bargain here indeed currently the lovely linen effect Ovio vinyl tile in Blanc is on clearance and a steal at just $0.69/sq ft! Another trusted retailer, Home Depot has a good range flooring in all kinds of different materials and including top brands such as Pergo, Mohawk, Merola Tile, Daltile. Having said that Home Depot do not have a massive range of white flooring options, though what they do have is good quality. For wood flooring there’s a choice of about 15 white or near white engineered hardwood; and just 7 white laminate flooring though the Pergo XP Coastal Pine laminate has a lovely weathered look. Where Home Depot excels is in the tile flooring area, with over 300 all-white or predominantly white patterned ceramic and porcelain floor tiles, including the cute glossy white penny round mosaics from Daltile’s Finesse range and some lovely hexagon mosaic options from Merola Tile. Home Depot also have a good selection of white area rugs and wall-to-wall carpeting. 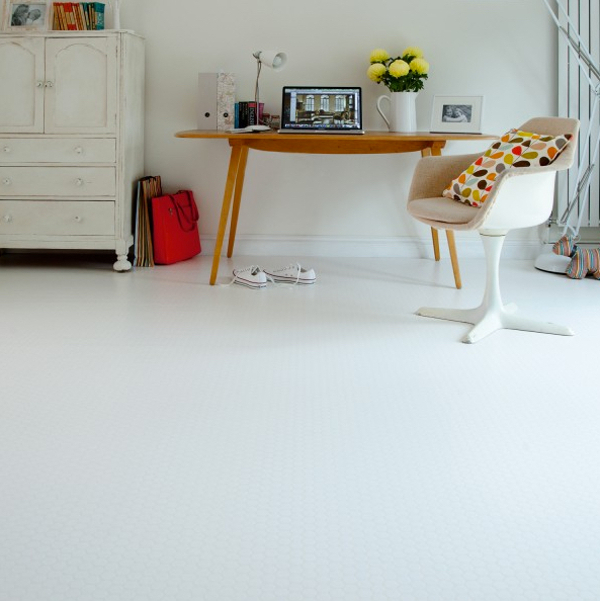 Still love the idea of white flooring? Here is our selection of beautiful rooms that feature gorgeous white flooring for further inspiration! 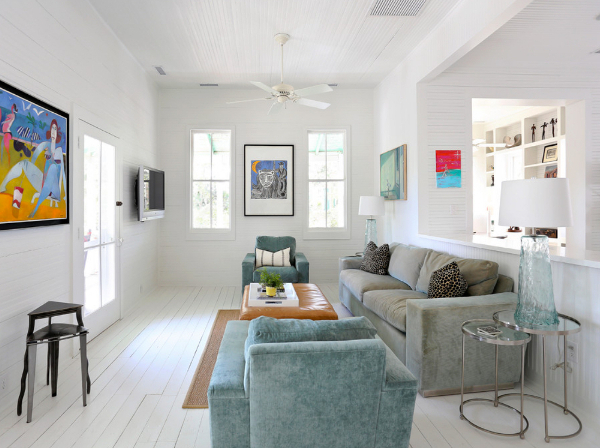 White wooden floors and white clapboard walls are the perfect choice for this modern eclectic beach house. 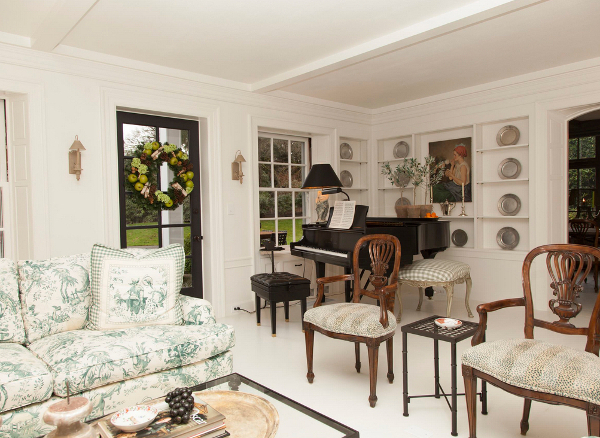 The warm white tone of these hardwood floors, perfectly matched to the walls, allows the beautiful classic furniture to stand out in this traditional home. This floor is the Akoya range from PG Model, an engineered maple with a semi-gloss varnish like finish sprayed using same techniques as in an automotive factory! Very sleek and modern. Here engineered beech planks have been carefully pre-finished with stain, allowing for grain and knot details to still be visible. This oak floor was bleached then whitewashed on site and finally sealed for extra protection. 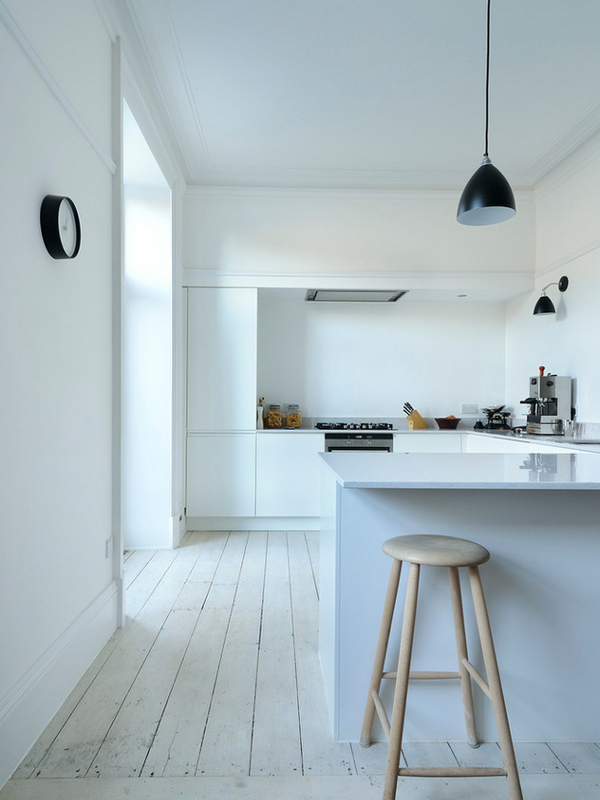 An original timber floor has been sanded and finished with white Danish oil, giving a rustic counterpoint to the sleek minimalist kitchen design. 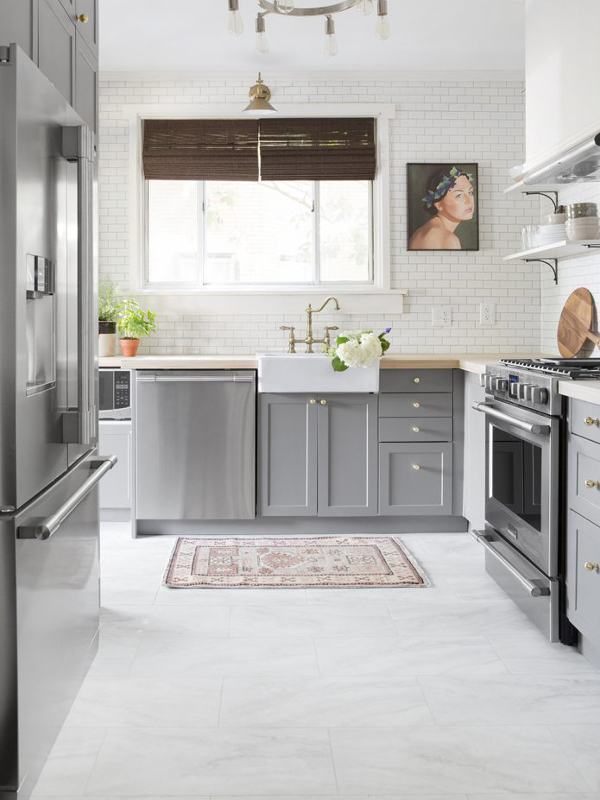 This farmhouse-chic kitchen features the pretty marble-look Fairmont Park LVT from Shaw Floors. The Prescott tile from Porcelain Wood also has a perfectly balanced, slightly scuffed aesthetic and is available in super-chic chevron formation. 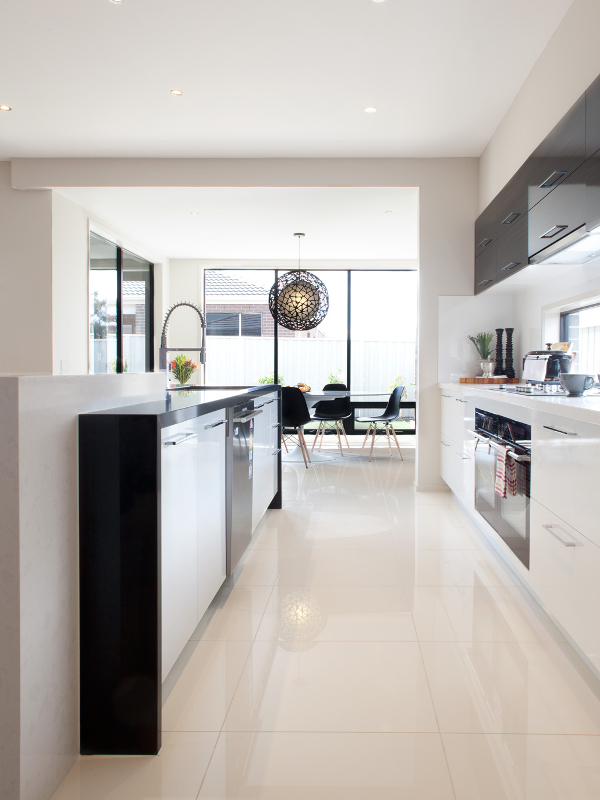 Superb high gloss porcelain tiles add extra gleam and reflective shine to this modern space. Would love to see it at night! Porcelain tile comes in all sorts of lovely shapes now, so a simple white tiled bathroom floor can have an added dimension of texture, like with these pretty matt white hexagon tiles. For an all-over white scheme it’s best if you mix up textures and opt for warm white tones; the polished limestone floor here alongside white painted wood and soft fabrics is the perfect choice. 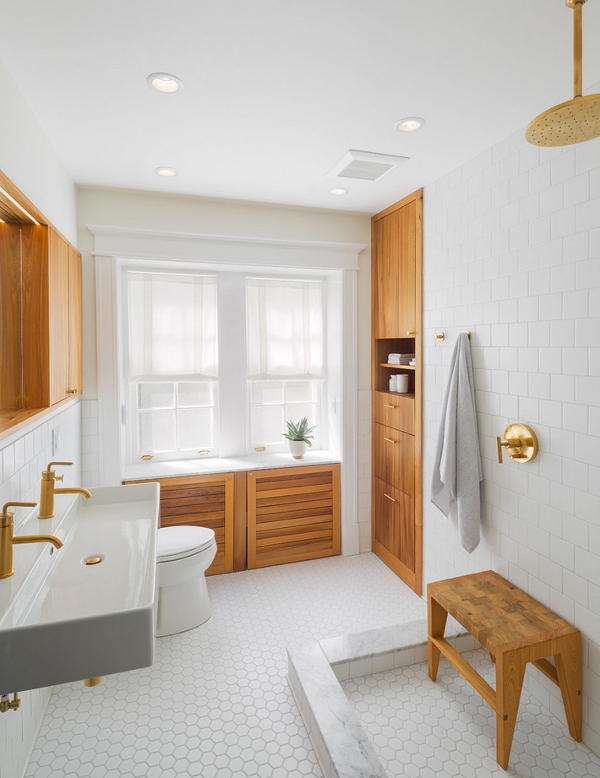 Gorgeous Carrara marble is featured in this peaceful bathroom – and the designer went the extra mile to specially select slabs with the least veins to maximize the calm atmosphere. 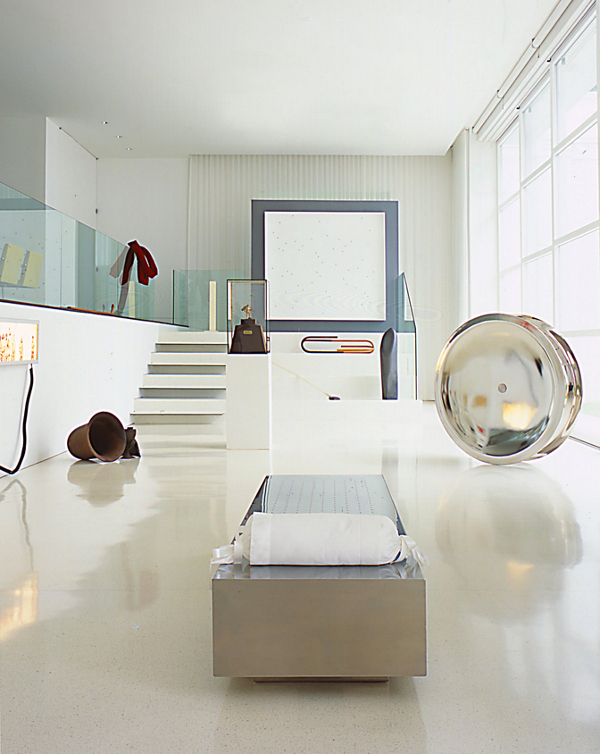 Polished white terrazzo has just enough flecks of other colors in it to keep this room from being too glaringly white! 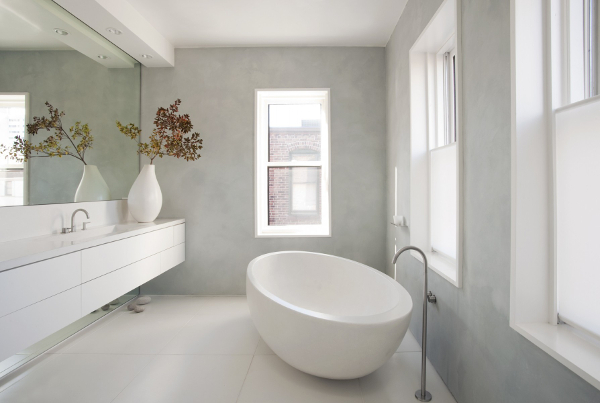 Beautifully soft matt white concrete is paired with dove-gray Venetian plaster walls to create a truly serene bathroom. This basement renovation is making the most of the available light with the glossy warm white epoxy screed cement flooring. Another white epoxy treatment on cement floor, but note how this white is much cooler, nearly gray in tone and gives a crisp finish to this stylish space. 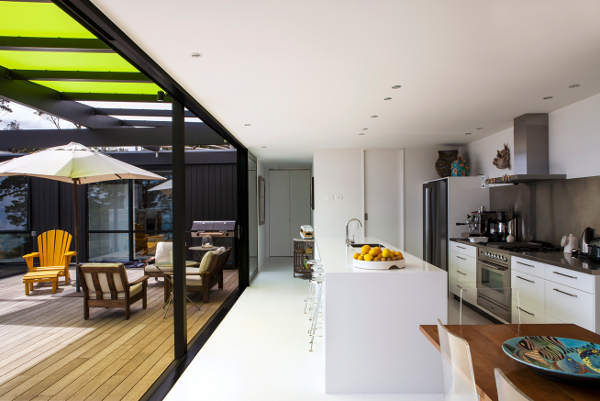 This seamless creamy white rubber flooring is the perfect soft texture to lead out onto the warm wooden deck. 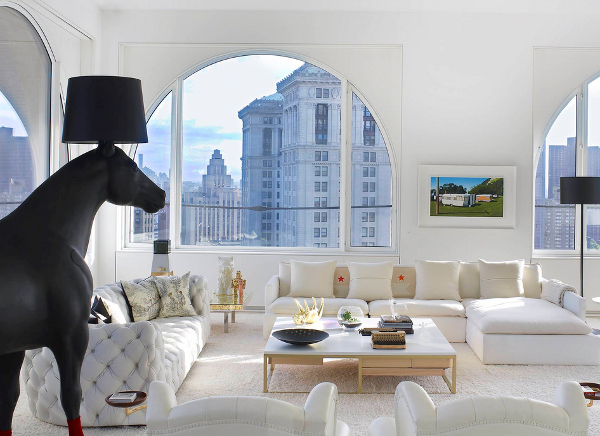 White rubber flooring and a real cowhide rug: an amazingly contemporary juxtaposition! Close up this vinyl flooring has a lovely dot mosaic pattern in relief to add texture and interest. The lovely pattern and texture of this white carpet is a beautiful balance for the dark caramel walls and brown patterned drapes. Immaculate, eclectic glam all in white: the supersized white shag area rug is the icing on the cake!